Where can we expect help to come from to ease this burden? It will not come from universal health insurance or increasing Medicare payments. It will not come from a new “pill” or “procedure.” It will come when we in medicine and science share with the public knowledge of a life style which will diminish and eliminate our common chronic killing diseases. How is this accomplished? Asking the public to stop smoking, exercise and eat a healthful diet has not worked. It is time to be more specific. Maintain advice to stop smoking and exercise, but convert to complete plant-based nutrition without oils, dairy and meat. In addition to reversing heart disease, we have witnessed reversal of carotid artery disease to the brain, elimination of leg pain (claudication) from arterial disease and restoration of erectile function. The only forces against resolution or our most serious diseases are medicine, industry and the government. The billions of income they receive from preserving the status quo make them a formidable adversary. How is this accomplished? Asking the public to stop smoking, exercise and eat a healthful diet has not worked. It is time to be more specific. Maintain advice to stop smoking and exercise, but convert to complete plant-based nutrition without oils, dairy and meat. Epidemiologic evidence and scientific study confirm this recommendation. One of us (T. Colin Campbell) in his best selling The China Study recounts his finding of virtually no cardiovascular disease and rarely any western cancer in Chinese provinces which had not yet industrialized and were consuming plant-centered nutrition. Yet as soon as these provinces gained wealth and could afford animal based foods, there was a prompt emergence of western cardiovascular diseases and cancer. Coauthor Caldwell B. Esselstyn,Jr. in his book, Prevent and Reverse Heart Diseasesummarizes his twenty year study applying plant based nutrition to patients seriously ill with coronary artery heart disease. 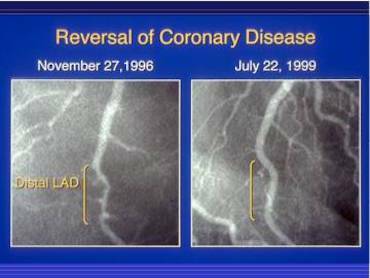 All compliant patients halted their disease beyond twenty years, often with striking evidence of disease reversal in their arterial photographs (angiograms). This included patients who were told at the beginning of the study by expert cardiologists hat they would not live a year.